UPDATE 5:25 p.m. -- As of 5:10 p.m. the 101 is open again, with one-way traffic control at the site of the accident. Expect delays through tomorrow, including one-way traffic control while a pavement repair is done. 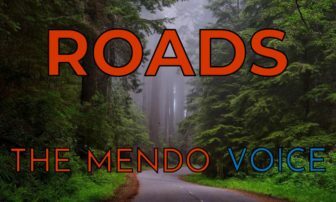 US HWY 101 NOW OPEN TO ONE-WAY TRAFFIC north of Leggett in Mendocino County. Traffic conytrol will extend through tomorrow due to damaged pavement.Video is the overturned truck being uprighted and getting ready for removal resulting from overturning on US Hughway 101 North of Leggett in Mendocino County.Road/Traffic updates: QuickMap.dot.ca.gov or download the app for Android or iOS phones. UPDATE 2:05 p.m. -- The California Highway Patrol has released the name of the truck driver who overturned his tanker truck this morning, closing U.S. Route 101 north of Leggett, and spilling gasoline onto the road, and potentially into creeks. 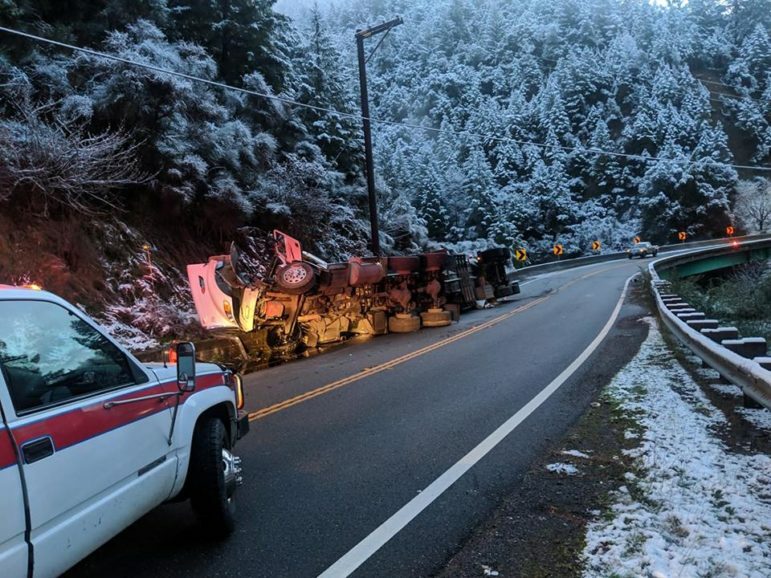 According to authorities Archie Campbell, 62 of Willits, was driving north on the 101 when he lost control of his tanker and crashed into Jitney Gulch Bridge. His tanker overturned and began to spill gasoline into the road. The spill has been contained but potentially hundreds of gallons of gasoline spilled either into a nearby creek or directly into the Eel River. Investigators from the California Department of Fish and Wildfire have been called to the scene, as was Mendo Hazmat. Drainage valves on the tanker were crushed by the crash, meaning that crews are having to drill into the tanker to pump the gasoline out, before clearing the scene. As can be imagined, drilling into a steel tank full of gasoline is a delicate and time consuming operation. The CHP has stated that Campbell does not appear to have been under the influence, and that he suffered only mild injuries. A large section of the 101 is closed, roughly between Leggett and Piercy. The CHP has stated that there is no estimated time of opening, and CalTrans is saying it may not be open till later this evening. People have attempted to circumvent the closure, causing the CHP to call in extra officers. 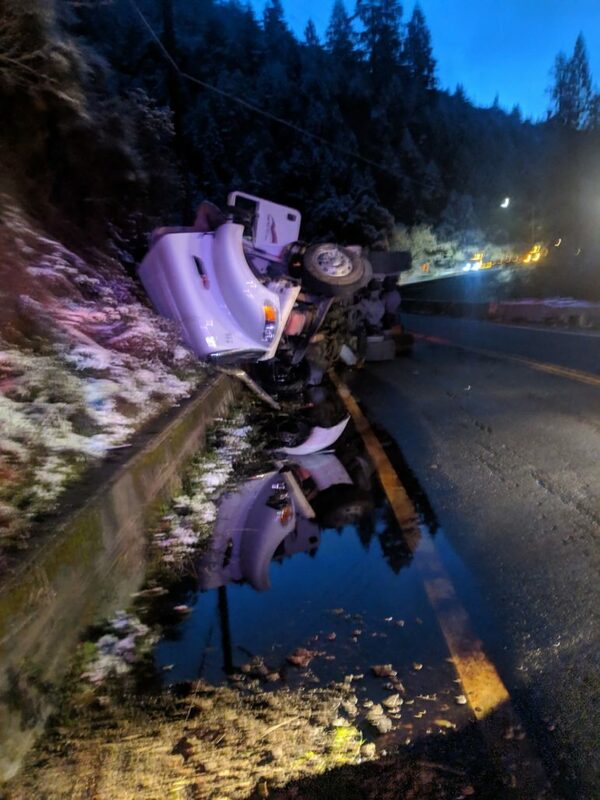 02/05/2019, at approximately 0620 hours, a semi-truck tanker, driven by Archie Campbell of Willits, CA., was traveling northbound on US-101, north of Leggett, in Mendocino County. The semi-truck was carrying a cargo of gasoline fuel. For reasons still under investigation, the semi-truck collided with Jitney Gultch bridge rail while negotiating the left hand curve of the bridge. The semi-truck overturned onto the roadway, blocking the northbound lane of US-101. As a result of the collision, the tank trailer began leaking fuel onto the roadway and shoulder. CHP personnel responded to the scene and assumed incident command. The driver was transported to Jerold Phelps Community Hospital for minor injuries. DUI does not appear to be a factor in this collision. Due to the fuel spilling onto the roadway and surrounding area, Haz-Mat protocols were established. 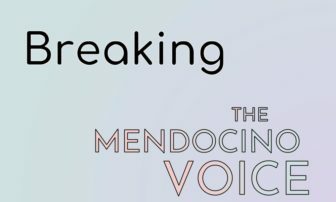 Mendocino County Environmental health was notified. US-101 has been shut down in both directions. Northbound traffic is being turned around at SR-1 and southbound traffic is being turned around at Reynolds Overcrossing, south of Piercy. An estimated time of reopening has not been determined at this time. The California Highway Patrol Garberville Area office is investigating this collision. The California Highway Patrol would like to remind motorists to slow down and use caution when driving in inclement weather. MENDOCINO Co., 2/5/19 — A tanker truck over turned overturned on U.S. Route 101 just south of the Peg House near Leggett around 6:22 a.m. and is leaking onto the highway. The 101 has been closed to allow for clean-up. There is currently no estimated time of re-opening, and CalTrans is instructing drivers to use I-5 as a detour. The accident occurred between Leggett and the Peg House, and southbound lanes are currently at Reynolds overpass just before Confusion Hill. There is no current information about where the northbound lanes are closed, but Officer Taylor of the Garberville CHP office said the closure will be at Hwy. 1. The tanker is currently still leaking fuel, as of around 8:15 a.m., and a tow truck is on the way. Fuel is being pumped our of the tanker into an additional empty fuel tanker. 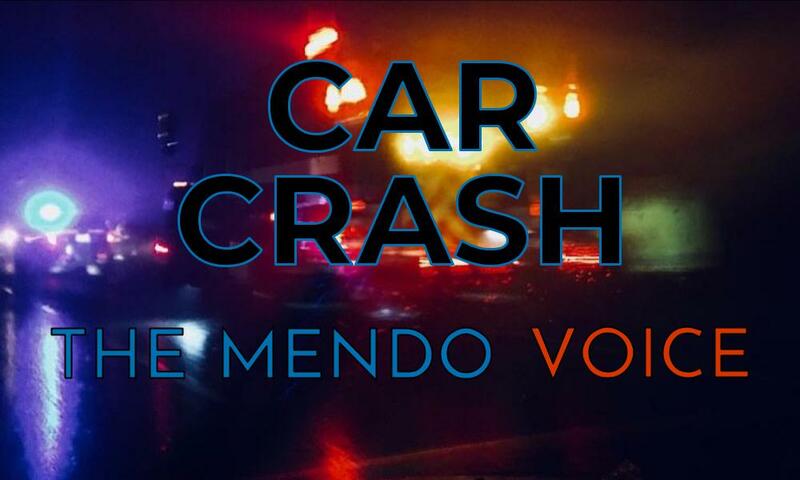 Mendocino County Environmental Health as well as the California Highway Patrol are responding. The driver of the semi was initially trapped in the truck, but has since exited safely, and there do not seem to be any major injuries reported. Officer Taylor said that there was at least a hundred gallons of fuel spilled, and there may be more if the tanker was full. Taylor expected the closure to last for at least six hours while responders to righted the truck and cleaned the road. Reader Jonathan Beck, who was on the scene, sent some photos included below. Beck and a volunteer firefighter helped the driver escape from the truck, and he also helped pile dirt near a storm drain to prevent fuel from leaking into the drain. Beck said another truck narrowly avoided crashing into the fuel tank after it overturned due to the icy roads. There have been a number of accidents overnight and this morning — please take caution as there may be ice or other collisions on your drive. A photo from reader Jonathan Beck, who was on the scene. We'll update as more information becomes available. Redheaded Blackbelt has some additional reporting on the collision beginning from the initial accident.